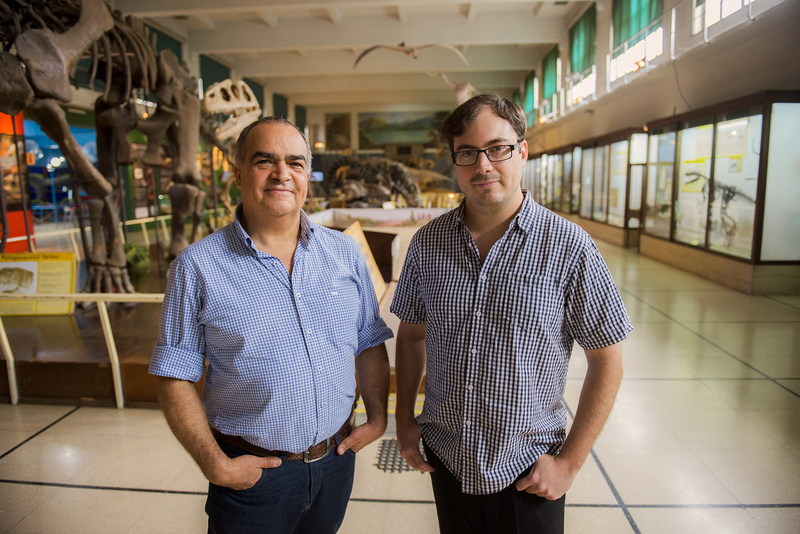 CONICET’s scientists participated in a research team that casts light on the early evolution of dinosaurs. The result was published in Nature in response to the March publication in which the English researchers had proposed a radical change in the family tree of the lineage of those prehistorical animals. Fernando Novas and Martín Ezcurra. Photo: CONICET Photography.. The dinosaurs traditionally are classified between Ornithischia – bird hipped dinosaurs, like the herbivore dinosaurs Stegosaurus, Triceratops and the Saurischia –lizard hipped dinosaurs- which in turn are divided between Theropoda –long neck carnivore such as the Tyrannosaurus and the Carnotaurus- and the Carnotaurus- and the Sauropodomorpha –long neck herbivore dinosaurs like the Diplodocus and the Argentinosaurus-. For this new hypothesis, the Ornithischia are more closely related to the Theropoda, forming a group called Ornithoscelida. The Sauropodomorpha are restricted to a separate evoluttionary line within the dinosaurs. In the new Brief Communication Arising published in Nature, Max Langer of the Universidade de São Paulo refutes this new hypothesis with an international research team that included the participation of three CONICET researchers: Martín D. Ezcurra, CONICET’s associate researchers, Fernando Novas, principal researcher at the Museo de Ciencias Naturales “Bernardino Rivadavia (MACN-CONICET), and Diego Pol, CONICET’s principal researcher at the Museo Paleontológico Egidio Feruglio (MEF). Due to the importance of the hypothesis formulated by the British scientists, paleontologists from different parts of the world felt the need to test that proposal. “It was a significant study that made us go back to square one to organize things in a different way. However, when we observed the matrix of the characters that had been analyzed, for instance, the ilium of the hip, we noticed that some of them were misinterpreted”, Novas explains. “After May, we started this replica and when we had the Baron cladistic matrix modified with our observations, the database was moved and we obtained the classic classification”, the scientist affirms. “When we recodify the characters and analized again this matrix, we obtained the tradicional result, which was consisten with what we thought was going to happen as we had seen the Baron results with skepticism”, Ezcurra comments and adds: “It’s important to emphasize that the English authors had seen about 45 per cent of the specimens, while our whole team had observed more than 95 per cent”. “Large databases are essential for the analysis of large-scale evolutionary relationships. Collaborative studies like this one are a growing trend since the big questions usually require quantities of data that exceed the capacity of a researcher working in isolation,” Diego Pol comments. On the other hand, Baron’s hypothesis explained an origin of the dinosaurs in the northern hemisphere, but Novas explains that in the re-analysis they did with their equipment, so that also confirms the traditional view that the dinosaurs originated in the southern hemisphere, and probably in South America. “This result reaffirms the importance of the Triassic rocks, approximately 230 million years old, of South America to uncover the origin and early evolutionary history of dinosaurs. The abundance and quality of fossil specimens preserved in the Chañares and Ischigualasto formations of the provinces of San Juan and La Rioja provide one of the best evidence worldwide to understand the ecosystems of the first dinosaurs and their precursors, “Novas concludes. Max C. Langer. Departamento de Biología, Universidad de São Paulo, Brasil. Martín D. Ezcurra. Investigador adjunto. MACN. Oliver W. M. Rauhut. Staatssammlung für Paläontologie und Geologie, Alemania. Michael J. Benton. University of Bristol, uk. Fabien Knoll. University of Manchester, uk. Blair W. McPhee. Departamento de Biología, Universidad de São Paulo, Brasil. Diego Pol. Investigador principal. Museo Egidio Feruglio. Stephen L. Brusatte. University of Edinburgh. UK.